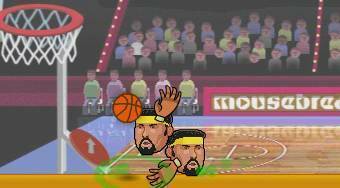 Do you like Sport Heads Basketball? Share it with your friends. In the game "Sport Heads Basketball" your taks is to throw as many balls as possible into the opponent's basket within the limit of one minute! At the same time you should defend your team well, so that your opponent gets only a minimum number of balls into your basket. Be very careful not to get your own ball into your own basket as a result of your distraction and clumsiness!